A gorgeous Class-AA building containing fully-equipped executive suites in historic LoDo, overlooking the Rocky Mountains and downtown Denver. First class facilities include state-of-the-art boardrooms, strategy rooms, meeting rooms and a private outdoor terrace, as well as cutting edge internet service and technology. These superb offices to lease are only moments away by foot from hundreds of restaurants, hotels, art galleries and retailers and are easily accessible from the 16t Street Mall. Close to Commons Park for relaxing lunchtime walks, this period brick business building is located in Lower Highlands, near the talent pool of the University of Colorado Denver. The unique workspace provides a great mix of private offices and shared workstations and lounge areas as well as a fully stocked refresh area. Located in Denver, this workspace provides you with access to everything you could need. This contemporary and luxuriously furnished business center is situated within one of Denver's most desirable and highly sought-after corporate districts; close a multitude of popular and premium brand names in retail, dining, accommodation and entertainment. Local transport links are also exceptionally convenient, with frequent road and rail services operating throughout the area and making it easily accessible for both clients and professional guests alike. Set within the vibrant and engaging city of Denver, this prestigious and technologically sophisticated business center environment provides all prospective professional occupants with a vast array of diverse workspace solution packages and services as standard; with a number of excellent facilities which include spacious meeting rooms, high speed internet, conference equipment, dedicated corporate telephony and more. Beautiful specialized recent-build containing light and airy, fully furnished executive suites. Cutting-edge technology, onsite conference rooms, flexible lease terms and a perfect location in Denver’s trendy business district are only a few of the benefits these spaces provide. They are also within convenient walking distance of dozens of restaurants, shops, hotels and public transport links. Benefitting from a fantastic location in the middle of downtown Denver, these preeminent offices to rent offer the complete package. Lessees take full advantage of the cutting edge technology, onsite shopping mall, fitness centre, hotel / apartments and one of the most elite addresses in Denver’s trendy business district. Providing an engaging and collaboratively diverse working environment across a wide range of flexible office space solutions, this business center is perfectly located in Ballpark, Denver; surrounded by both great amenities and great transport links. Within walking distance and the immediate vicinity of the center is a significant number of local services and amenities including a range of shops, restaurants, hotels and leisure pursuits. With a strategic location in the North Capitol Hill neighbourhood of downtown Denver, this business center offers a range of office solutions to suit your needs. 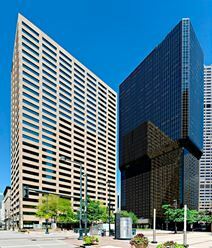 Situated in the financial district close to the Colorado Convention Centre, this modern building offers a stylish and prestigious business address. With convenient access to Downtown and Capitol Hill this fantastic coworking space has been designed to catalyze connection, engagement and collaboration and is home to a vibrant, creative community of start-ups, freelancers and creatives, philanthropists and activists, writers and developers, designers and solopreneurs. For start-ups and small businesses, freelancers and creatives, philanthropists and activists, writers and developers, designers and solopreneurs, let this be place where your work comes to life. Bringing you both collaborative and private workspaces this center is located in Downtown Denver and is surrounded by a wide range of local amenities with upscale dining and shopping just a short walk away from your front door. Thoroughly and recently refurbished, these sophisticated executive suites are fully equipped with the latest technological trends. These plush offices are available furnished or unfurnished and offer clients the convenience of professional staffed reception. Clients also profit from the suites’ superb location just minutes’ away from downtown Denver and upmarket Cherry Creek; as well as the excellent range of transport links available throughout the locality. Distinguished modern executive suites available in Larkspur’s premier business centre. Benefits include professional support staff, state-of-the-art internet technology and flexible lease terms. Superbly located just off Highway 101, these deluxe offices to rent are within easy driving distance of metro Denver. The regional transport links are also excellent, with a wide range of convenient and frequent services in operation. 5 minutes away from the Colorado Blvd Office District and convenient nearby retail make this a very prime location for any business. Here at this office campus setting with a garden area, 2 free conference rooms available and free parking for all tenants and visitors. Surrounded by plenty of places to eat and pubs for after work get-togethers. in one of the - most charming neighborhood, this workspace is the perfect setting even if you decide to host an offsite or a workshop you can be assisted with the setup. Presenting these elegant executive suites catered to by support staff and top-of-the-line facilities. Each office to rent offers a flexible working environment and the best in modern technology. Clients benefit from the superb location Denver’s metro area, just moments from downtown and public transport links. The regional transport links are also excellent, with a number of frequent and convenient services in operation throughout the locality. This business park campus setting is beautifully landscaped and centrally located in Hampden, Denver just five miles from downtown. With a sleek marble interior and a wide range of flexible office space this tech-powered business center also has great on-site facilities including a fitness center. The local transport links in the area are excellent also, with frequent an convenient services in operation throughout the area and its surroundings. This ultra-modern, sophisticated business centre offers an excellent range of executive suites. These offices to lease are superbly located at the junction of I-25 and I-225. Clients benefit from onsite parking, several nearby hotels and restaurants, as well as excellent public transport links. Presenting these chic, modern executive suites in prestigious Cherry Creek North. With fantastic cutting edge technology and a superb, easy-to-access location, clients can also take advantage of the hundreds of restaurants, galleries and boutiques in the surrounding area. This attractive business centre is easy to access from Colorado Blvd and University Blvd, and is only minutes’ away from downtown Denver. Introducing fantastic cutting-edge virtual offices with executive suites available for the latest in modern convenience. Offering the best in technology and amenities for forward thinking businesses, clients benefit from the added luxury of a flexible working environment. This centre is located in the heart of elite Cherry Creek, within walking distance of the shopping mall, several high-end restaurants and a great choice of entertainment venues. This space is a collaborative environment designed to support all your needs, 100-person companies and everything in between. Sharing an array of amenities with fellow members including a full kitchen, coffee stations, and rooftop patios built to bring fresh thinking to your work. Flexible, private suites are designed to scale alongside your business. This is much more than a coworking space, you'll be prepared to unleash your full potential working here. 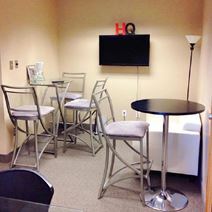 In the thriving and commercially significant business district of Cherry Creek North, this locally renowned and highly prestigious private office center and coworking space is specifically designed to be innovative and collaborative with premium corporate services tailored for a wide range of explicit and specific business requirements. The regional transport links are also excellent, with a number of road and rail services in operation close by. Set within a vibrant and commercially significant corporate community district, this state of the art and contemporary business center is a highly sought-after and very impressive working environment, perfect for any type of client or business requirement across any industry. Offering a diverse range of technologically sophisticated and state of the art facilities on-site for tenant use, this center is ideal for any professional. Situated 20 minutes from Downtown Denver this multi-use park is located close to a variety of companies from mining to telecoms, with a host of restaurants and department stores on your doorstep. 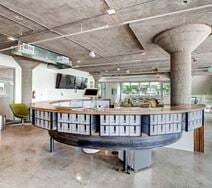 Located in the trendy ballpark neighbourhood of Denver this innovative and collaborative workspace location has an industrial yet unusually chic ambience that is ideal for smaller office requirements or individuals in search of comfortable and unique working environments. With exceptional facilities and services provided to all occupying tenants on site, as well as the surrounding area offering exceptionally convenient transport services, this center is the perfect location for any business requirement. This center provides modern, industrial coworking space for small businesses, corporate teams, or start-ups with a cozy atmosphere. Close to Platt Park restaurant neighbourhood the location is ideal for grabbing a spot of lunch or dinner after work. This center is located in a striking office tower, with spectacular panoramic mountain views. Offering a full selection of office spaces, as well as all the business support services you could require, this center is ideal for your business. This center is locates close to RTD and the interstate with many close by restaurants and shopping. Stop at the on-site gym or the roof top deck for views. The 13000 square foot center is furnished with Wifi, on-site cafe, mail and package handling, and many more amenities. Stop in and talk to the on-site management team to find what is best for you and your team. You will not be disappointed with this center. Here you will enjoy work whether you are launching or growing in this space you'll find all the help you need working alongside fellow entrepreneurs and like-minded people. The office is centrally located, close to Washington Park, amazing happy hours including Hacienda across the street, as well as events that we host for startups. No need to worry about the hassle of parking downtown here you'll always find a place for your car. Just one mile from the hospital it comes as no shock that this area is popular with medical companies. The center itself offers excellent connections to Denver and is close to a number of small town retailers and residential spaces. Ideally situated in the thriving Denver Technological Center, these all-inclusive executive suites, with onsite meeting rooms and state-of-the-art technology, suit any and all modern business requirements. With easy access to I-25 and I-225, upscale restaurants, dozens of hotels and shopping malls are all within minutes’ of these offices to lease. Offering a huge range of sizes, these spaces are perfect for both smaller businesses and large organizations. These state-of-the-art virtual offices with executive suites are now available, for the latest in modern convenience. Offering the best in technology and amenities for forward thinking businesses, clients benefit from the added luxury of a flexible working environment. 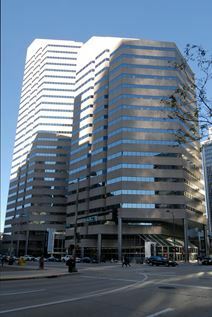 Located just minutes’ away from downtown Denver, these elite offices to rent are an ideal investment. Just two blocks from the state-of-the-art Colorado Convention Center this office space features eight floors of private offices, office suites, and co-working space, as well as two mezzanine levels and a rooftop event space. The regional transport links are also excellent and make the center easily accessible from any part of the region owing to the extensive and highly convenient services in operation. Catering for any type of professional requirement or specific business need, this state of the art and commercially significant business center is a landmark corporate location which is locally and economically renowned as being one of the region's most luxurious and high quality office environments. The regional transport links are also excellent and offer prospective tenants and commuters with a range of convenient services. Inspired by the design of a ski lodge, this newly built iconic glass building is just moments from Union Station and provides quick access to Denver International Airport ideal for out-of-town clients. The friendly and creative atmosphere is made up of a mix of large open-plan communal areas, conference rooms and private offices. The regional transport links are fantastic, with a number of frequent and convenient road and rail services in operation throughout the immediate area. This space has a beautiful modern appeal. With break lounges designed to keep tenants happy and peaceful and conference rooms to attract the excitement for collaboration. Tenants can enjoy the access to the building 24-7 along with flexibility with lease terms. This center provided spectacular reception services to enhance and help your business and copy and print facilities to ensure all of your work is done. This center is located in the heart of Denver near many fine dining and local attractions. This particular center is located one block from the Pacific Ocean making for the perfect break or getaway from the office. You have easy access to Union Station and Interstate 25 making it a convenient every day route for coming in to grow your business.